When checking an animal for disease we often collect blood to check for blood cell abnormalities. Normal red blood cells in mammals are round, but occasionally we see abnormal and interesting shapes that can be a clue of disease. 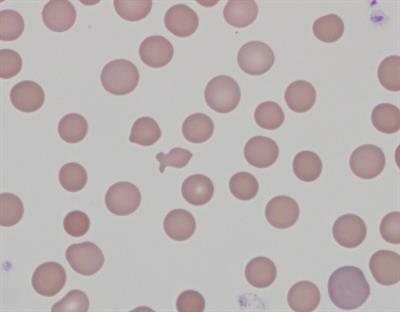 Normal red blood cells from a dog, like the image above, are round and have a pale centre. The big blue cell in the lower right of the image below shows a leukocyte (eosinophil) which is part of the body's normal immune system. They help the body fight infection and other diseases. 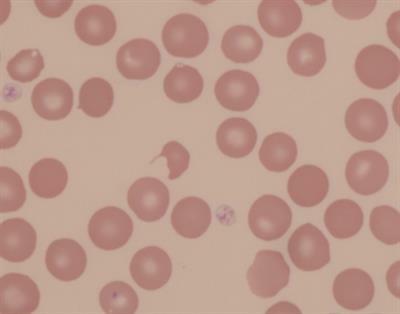 Here are some examples of cases we have had with abnormal blood cells which have showed signs of diseases. This dog was anaemic (had low red blood cell count). When we examined the blood film we saw lots of crazy erythrocyte shapes which supported the presence of a bleeding cancer called haemangiosarcoma. We call these crazy starfish shapes acanthocytes – but we think the one in the centre of the magnified image looks like a leafy sea-dragon (if you use your imagination). 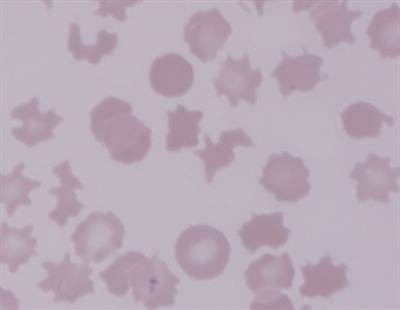 Image: Red blood cells of a dog with haemangiosarcoma, a type of bleeding cancer. This dog was also anaemic (had low red blood cell count) and we were trying to find out why. When we examined the blood film we noted red blood cells with blisters (upper left) and the fragmented blood cell in the centre which our pathologist from New Zealand thought looked like a Kiwi bird. These changes suggested the cells were being damaged as they moved through abnormal vessels. The dog was later diagnosed with kidney and heart disease. Image: Red blood cells of a dog later diagnosed with kidney and heart disease. This rabbit was losing weight and was found to be anaemic (had low red blood cell count). 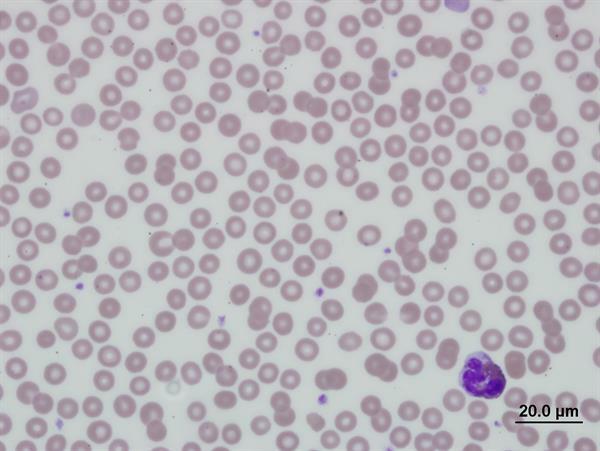 When we examined the blood film we saw this fish-shaped erythrocyte which was a fun incidental finding. Image: Red blood cells of a rabbit who was anaemic. For further information and to make an appointment, contact us.